Book your online reservation directly with top hotels in Arc de Triomphe Paris - from two star, economy, child & family friendly lodging, first class accommodations to superior hoteles, deluxe luxury hotels and resorts. Find downtown Arc de Triomphe hotels, midtown, business district or airport hotels using our search engine, and find the best hotels in the Arc de Triomphe area for your next family vacation, romantic weekend getaways, holiday, or business trip. MonHotel Lounge & Spa has reinvented itself for this new year. The hotel was extended and counts now 50 rooms, some of which are entirely new other have been completely renewed. The artistic direction that is the soul of the property stayed in the gifted hands of Aurelia Santoni, interior designer and scenographer. The baroque charm of some elements echoes the façade of the haussmanian building, while the modernity of the equipments create a harmonious contrast. There is no place in the hotel where art photography is not present, the collection gives the lead role to women that seem to be the rulers of the place. Ideally located between La Defense, the Porte Maillot, the Arc de Triomphe, and the Champs Eysees, MonHotel Lounge & Spa is ideal for business and leisure. Hotel Napoleon Paris - France - Luxury Hotel with 102 rooms, suites and meeting rooms, located next to the Arc de Triomphe, Champs Elysees and the Lido, a step from Congres & Exhibition Center, Louvre Museum, Opera House, Eiffel Tower and La Defense District. Close to the Arc de Triomphe and the Champs Elysees, discover the Hotel Ampere – the perfect combination of charm and tradition, a very comfortable, contemporary hotel in the heart of one of the most prestigious area of Paris. A haven of peace and tranquillity at the heart of the hustle and bustle of Paris, the Hotel Ampere cares for its garden as it would a precious gem. The abundant, well-tended vegetation will make you forget all about the frenzy of city living overnight. Enjoy the view over the indoor garden and the terrace on a sunny day. There can be nothing more exquisite than enjoying a relaxed breakfast on the terrace or continuing your summer evenings in the garden, dining in a soothing, romantic setting to the sound of the piano. 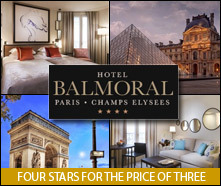 Completely refurbished in 2013, on a calm street 100 metres from the Place de l'Etoile, the **** Hotel Balmoral provides cosy comfort in an elegant setting, in the Parisian tradition. The hotel is an ideal departure point for a day in Paris: A stone's throw away from the Champs Elysees, at the foot of the RER station going to La Defense and the Palais des Congres, at the foot of the Air France bus terminal, 15 minutes from the Eiffel Tower, and very close to the shops of Faubourg Saint-Honore and theatres. After your workday or your tour of the capital, you can relax in the large lobby and bar lounge. Each of our 50 rooms is strictly non-smoking, air-conditioned, and unique. The rooms offer very modern comfort in a calm and relaxing atmosphere. 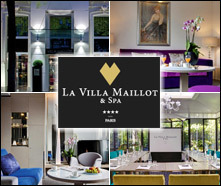 The Hotel Montfleuri Paris, ideally located in the heart of Paris, on the Grande Armee Avenue, just a few steps from the Champs Elysees and the Arc de Triomphe, is a luxury that, with all his perfect services, will offer you a true heaven of calm and exclusive moments of relaxation in the middle of an enchanting contemporary design. The Hilton Arc de Triomphe Paris hotel sits among iconic Paris landmarks 10 minutes' walk from the Champs-Elysees. Indulge in the mosaic-decorated spa or stroll the Andalusian Patio garden. The Executive Lounge offers sweeping Paris views.